Read what our customers are saying about our cleaning services in Belleville and metro Detroit. The team arrived on time and were enthusiastic professionals who are proud of their work. I am beyond thankful for this cleaning team. I will contact them for more projects. Highly recommend. I needed last minute floor cleaning and Steve came through for me. He was courteous, thorough and left everything 100% better than he found it. The crew was very polite, friendly and most importantly thorough. We got the deep clean; getting ready for the holidays. Price was fair based on our home size (and the amount to clean). We would hire them again. Thank you Steve and your super efficient team. Never imagined the house could look so clean. Steve was fabulous! Very prompt, very professional and his team did a wonderful job! We will be using Steve and his team soon for regular cleanings and i surely can't wait. 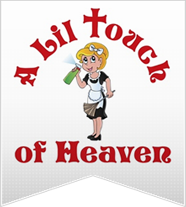 I hired A Lil Touch of Heaven LLC for a Move-In cleaning. They came with 5 people ready to start the minute they arrived. They were all very nice and friendly. They did a great job cleaning all the bathrooms, floors, kitchen cabinets, windows, and refrigerator. I paid extra to get my hardwood floors cleaned by their Bona wood floor cleaner. It made my floors look amazing. Not only did they look clean but they felt clean. You could just feel how clean they go with the Bona. They wiped all the baseboards down and disinfected. They even sprayed some cleaner that helps with the smell of cat. The people who lived here before us had a cat and you could really smell it but after the spray and all the cleaning it really smells 100 times better. The only thing i noticed after they left were that the blinds were not wiped down 9something i didn't specify to them though). Just make sure to tell them what you want don and they will do it. They did a great job and I would most definitely recommend them! The best of the best, very professional and reliable. I'm very pleased with their work. Don't even bother hiring somebody else. Steve cleaned one of the rental houses that we have. He was a few min late to the meeting, but that was a new area to him, so I have no problem with that. Discussed what needs to be done, he set up the time and had the crew clean it. He said it took a little longer than expected. They did a great job and will hire him again for the next house. Steve was able to get my house cleaned the same day as i was quoted. Reasonable in price. At first i was not happy with my bathroom, but Steve came back and made it right. Definitely great customer service!!!! Because I have had a lot of cleanings in the past, the deep clean was more thorough than any other I have had. They are way more professional than any other service I have had before, from the beginning contact with the estimate all the way to today. I have been using their service for 2 years now because of their great professionalism. They use the highest quality of cleaning products and everything they bring int your home is clean as well (mops, vacuums, everything). Four people cleaned the house in less than three hours. Excellent customer relations. Good job. I have used different cleaning services before, and this is the first time that I do not have any complaints. They are great; they do a great job cleaning for me. Always spotless. They are honest and trustworthy. I would highly recommend them. Tell us about your cleaning experience! Click the button below to write a review of your own.